Genea-Musings reader Warren asked a question in an email recently, and I'm sure other readers want to know the answer too. His questions was "Why don't you use historical place names in your Family Tree and blog posts?" The simple answer for me is - Convenience! I want to be able to use the mapping features in my RootsMagic 7 desktop software program and also add place content to FamilySearch Family Tree. That doesn't mean my view is correct, or that everyone should agree with me. The FamilySearch Family Tree wants standardized place names that are based on current place names and jurisdictions. RootsMagic provides the FamilySearch standardized place names in their place list, and inserts them into the FamilySearch Family Tree when requested. However, many genealogy professionals assert that we should always use historical place names existing at the time of the event because those names will lead us to the correct jurisdictions. * Salem and many other towns in current Essex County, Massachusetts were in Old Norfolk County in Massachusetts Bay Colony in British Colonial America from 1630 to 1691 or so. * Medfield and many other towns in current Norfolk County, Massachusetts were in Suffolk County in Massachusetts Bay Colony in British Colonial America from the 1630s to 1778, and then in the United States until 1793, when Norfolk county was created from part of Suffolk County. * San Diego in California was founded in 1769 by Spanish priests and soldiers, so the historical place name might be San Diego, California, Spanish Colonial America. In 1823, Mexico became independent, and San Diego would then be San Diego, California, Mexico. In 1848, California became a territory of the United States, so it would be San Diego, California Territory, United States. San Diego County was formed in 1850 when California became a state, so the current city of San Diego is San Diego, San Diego, California, United States. * Think about the countries of Europe - how many times have places in Germany, Belgium, Poland, Norway, Italy and many other countries had a change of jurisdiction? Standardizing these place names for mapping purposes is one thing, and has been done by Google, Bing and other mapping websites to use in Global Positioning Systems devices and applications. The genealogy programs and FamilySearch use those map websites. Capturing historical place names, and creating a list by date of the historical place names is being put in place by FamilySearch on the FamilySearch Places website - https://familysearch.org/int-std-ui-research/. How can genealogy software family tree programs deal with this? Several programs try to help. I will look at some options in my next post in this series. I try to use the name of the location as it was when the event happened & then add the current name for that location in . Of course, when writing a report or book that can be done. In a program with just a little dialog box it is harder to select just one. FS Family Tree has historical standardized places that pop up too from which you can choose. Not complete by any means yet. And you can always put in your own version of a place, choose the closest standardized place, which will stick, and then retype in your preferred historical place, click off to the side, and you have both places. Wall la! In many localities there is confusion in place-descriptors utilized by websites and their search engines, where a village or borough name is the same as the district, township or New England Town that surrounds it. My observation so far is that this originated with creation of the GEDCOM format in order to save space (e.g., file size). 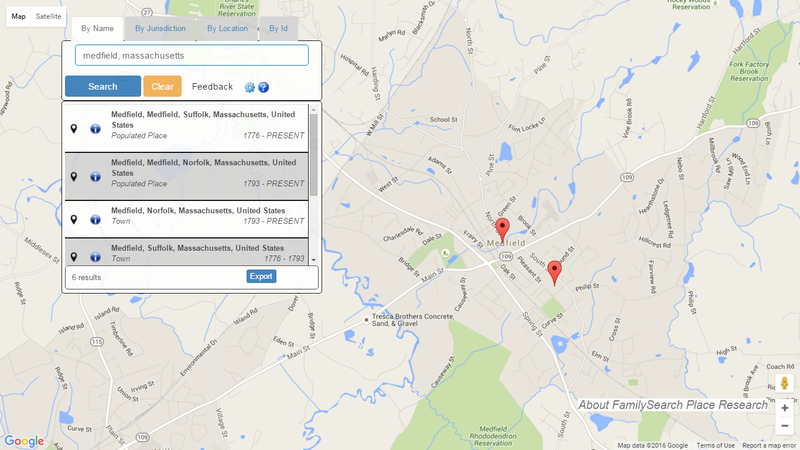 So in the Family Search map's list for Medfield, the first two entries have two Medfields in a row. One is the village name, the next is the Town name. But the second one is not identified as a Town. Similarly, FamilySearch and other entities tend to drop the "Borough" designation in Pennsylvania, so if one sees "Covington, Tioga, Pennsylvania," those familiar with PA counties intuit that Tioga is a county, but what about Covington? Is that the Borough or the Township? Proper designations of such matters are different in PA than in New England. In PA the boroughs, while usually geographically within a Township, are never described that way in a place-name. If it's the borough, it should be called that, and if it's in the Township outside the borough, proper Township designation should be present. The same problem exists elsewhere, such as in WV, where there have been Magisterial Districts which have the same name as a village or city within them. If one sees "Mannington, Marion, West Virginia," someone might recognize "Marion" as a county, but will not know if "Mannington" is for the city or for the Magisterial District surrounding it. This can be especially confusing if an event place was "Quaker Fork, Mannington Magisterial District, Marion County, Virginia." If one drops the District designation, one might think the stream (Quaker Fork of Bingamon Creek) was in the village of Mannington, which is not so. But this sort of designation is very useful for those of us who must distinguish between same-named persons who might be very similar in age, if not in parentage. I suspect that this planned confusion was perpetrated by the GEDCOM designers who just casually thought everyone lived in cities, and did not have specific historical knowledge of the above issues. Do wish that software programs had a way to enter both the old name and the new name of a place where an ancestor lived but since there isn't such an opportunity, I use the current place because I can map a location to a current location but not to an old location and also that's where I usually need to look for more source information about that person. While I do understand that my personal concept doesn't align with that of many professional genealogists. Example - when I add Portsmouth, Rockingham, New Hampshire, United States as a death location to a person who died in 1758, RootsMagic appropriately tells me that Rockingham County was not created until 29 Apr 1769 and New Hampshire wasn't created until 7 Oct 1691 and United States wasn't created until 15 Nov 1777. It recommends that I name this place Portsmouth, British America. While RootsMagic is correct and that technically the death location was Portsmouth British America. However I still list Portsmouth, Rockingham, New Hampshire, United States because that's the location where the probate records and other important vital records for this person are most likely filed.